Anchoring is a key technique used in Neuro-Linguistic Programming and helps people achieve outcomes in life they desire. Here’s a quick primer on the topic. NLP is an alternative therapy that can be engaged to change emotional behavior and achieve self-awareness and effective communication. Examples in the real world include helping with smoking cessation, weight loss and building rapport and relationships. I use elements of NLP in my Virtual Gastric Band program as a tool and resource for clients to use if they’re subjected to food cravings. Anchoring is one of a number of NLP techniques for bringing about significant change in a person’s life. Anchoring uses a representation – either internal or external – to trigger a feeling, behavior, or memory. 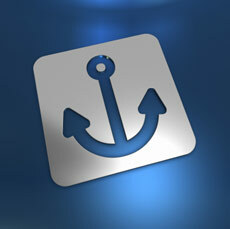 Using the anchor, we can trigger certain behaviors, thought patterns, or emotions, and change aspects of our lives. In fact, we use forms of anchoring all the time. When you drive up to a traffic signal and see a red light, there’s a good chance you brake without thinking about it. This is an unconscious process. While you probably had to think hard about it when you first learned to drive, the response is now automatic. Most of the time, we don’t know that anchoring is happening in our lives, since its outside consciousness. However, when we do it on purpose, we can train ourselves to engage in behavior we otherwise wouldn’t, such as quitting smoking, becoming comfortable with something that frightens us, or losing weight. When we come across a trigger, our internal representation systems activate, and there’s a response. It could be an action, a memory, or a number of other things. NLP practitioners tend to look at life as a combination of intentionally and unintentionally selected anchors. From advertisements to the smell of your favorite food, you encounter all kinds of anchors in everyday living. Anchors can be both positive and negative, and negative anchors can cause real problems for some people. For instance, if you developed a negative anchor relating to something your spouse does, it could seriously hurt your relationship. Your spouse would be triggering bad feelings in you without ever knowing why. The good news is that NLP anchoring is an excellent tool for tackling stubborn conditions. When anchoring is performed by a practitioner it’s done in steps. First, the specific situation to be triggered by the anchor is induced. For example this may be a feeling of a calm and relaxed state or a feeling of confidence. While in this state the anchor is placed such as pressing fingers together or thinking of a color such as red. The connection between the desired state and the action to induce it each time is made. Then, the state is interrupted, and the anchor is tested to see if the correct experience has been achieved. Anchoring is an excellent technique for helping people stop cravings and get rid of bad habits. Intentional anchoring can be done as part of hypnosis, with a professional hypnotist assisting you. You can also do it on your own and to others in an ethical way. You probably do it all the time without noticing. Every time you smile and compliment your restaurant wait staff, you’re creating an anchor that tells them you’re pleasant to serve. The next time you go to that restaurant, you’ll probably get better service just by repeating the anchor – a smile and a compliment. Creating these types of anchors in yourself and others can make a huge difference in your life. You can help people associate your presence with a good feeling, help yourself get around a bad feeling associated with a certain place or activity, or attach a good feeling to a chore or something else that might seem unpleasant. If you have trouble implanting anchors on your own, talk to an NLP professional, who can help you implant the ones you desire. Anchoring is one of the most powerful techniques NLP has to offer. When used correctly, it can change the lives of people suffering from serious challenges. Whether it’s a poor self image or relationships, or a bad habit, NLP anchoring can help move a person forward and get the outcomes in life they desire. As I mentioned I use NLP Anchoring in my private VGB program. Find more details about my Private Virtual Lap Band Hypnosis Clinic here.